Five friends go to a remote cabin in the woods. Bad things happen. If you think you know this story, think again. From fan favorites Joss Whedon and Drew Goddard comes The Cabin in the Woods, a mind blowing horror film that turns the genre inside out. That’s the description released by Lionsgate, so does it live up to its hype? Yes, yes it does. Five teenagers head off for a weekend at a secluded cabin in the woods. They arrive to find they are quite isolated with no means of communicating with the outside world. When the cellar door flings itself open, they of course go down to investigate. They find an odd assortment of relics and curios but when one of the women, Dana, reads from a book she awakens a family of deadly zombie killers. There’s far more going on however than meets the eye as the five campers are all under observation. To start off let’s talk about the acting. Loved the acting, from the office workers really knowing how to show a bored group of workers even though there’s nothing boring about what they do, to a drugged out loser who seems to be the only one getting the situation like a film watcher screaming at the screen “don’t go in there!” yeah that stuff. The film starts off very much like a horror flick with a fantastic flare of comedy and dark comedy alike, the horror aspects of this film where actually very well directed and will make you jump in your seats but also look fantastic for the films budget of only $30,000,000 which you will get when you see the movie. Then there’s something that threw me a bit when I watched it which was the amount of comedy this film displayed but still felt like a horror film, it’s like a scary movie film with real scares, people and effects. The Sci-fi elements of this movie are best left to watching as talking about them will be a spoiler I am afraid, but I will state that it’s a fun experience and that what Sci-fi elements there are will not be as important as the trailer will lead you on. This film will definitely make an impression on everyone who sees it and would recommend it to a broad spectrum of people whether it’s for gore soaked horror or side splitting dark comedy it works on many levels. Seriously just buy the damn DVD like I will be. Finally I would like to know what everyone thinks of this film, I am sure opinions will be fun to hear. Oh and what do you think of the gallery slideshow? I loved this film, very different to other horrors. Typical Joss Whedon humour. I liked your review and loved the movie. Even with the continuity error I nagged at in my review this was a horror comedy with a heck of a lot of intelligence. I loved the acting especially Bradley Whitford. I want this on Blu-ray with as many featurettes as they can cram in. It ought to be a camp cult film. 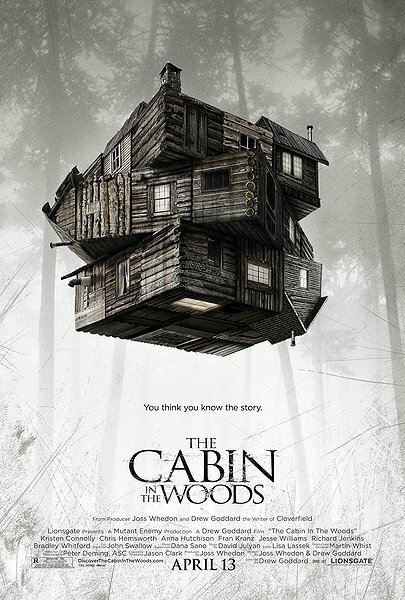 Thank you for the detailed review of “The Cabin in the Woods”; I have a friend and co-worker from Dish who has encouraged me to see this movie. Being that I love the horror genre, and am a huge admirer of the movies that play with the darker side of the psyche, I’m convinced this will be phenomenal. My work keeps me away from home, so using Blockbuster @Home to get the Blu-ray in advance will be perfect for a wind down night; I am stuck in the hotel a lot. Having a movie to reflect on always helps if an unseen force comes between my final destination and me. I’m generally not a fan of straight horror films (but I do love dark thrillers, and there is a very fine line between those and horror films), but this sounds different. I should probably give it a shot. Seems like a very fun film that you can still check-up on no matter how long it’s been. It’s going to be a horror film that stands the test of time and with good reason: it’s exactly what horror movies should be. Good re-review Tim. I reviewed it when it came out. I loved it with it continuuuty errors and all. Bradely Whitford was a screan and the ending was a neat twist. Its one of those son to be a modern cult classic. Good review. Well I stumbled upon it by accident and thought it would be a good feature. When you upload images go to the gallery and scroll down to the bottom and click insert slideshow, that will show all the images you have in your gallery on your post.